Visit the Stalking Resource Center. Stalking is a crime. It is not the victim’s fault. In Michigan, stalking is defined as a “willful course of conduct involving repeated or continuing harassment of another individual that would cause a reasonable person to feel terrorized, frightened, intimidated, threatened and/or harassed.” In other words, stalking is any unwanted contact between a stalker and their target that directly or indirectly communicates a threat or places the victim in fear. If you are being stalked (or think you might be), report it immediately to the U-M Police Department (UMPD) at (734) 763-1131. Stalking is an unpredictable and dangerous behavior, which can escalate into actions that are even more aggressive. Intervention by the police may be necessary to stop this behavior. Trust your instincts. If you feel unsafe, you probably are. Take threats seriously. Danger is usually higher when a victim tries to leave or end the relationship or when the stalker talks about suicide or murder. Establish your boundaries. Tell or write to your stalker that you do not want contact. 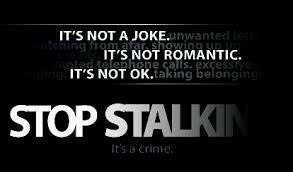 Let others know about the stalking behavior: friends, family, classmates, teachers, neighbors or co-workers. Share both photos and a description of the stalker and their vehicle. Keep any evidence (screenshots, voicemails, text messages, etc.) and document all contact from your stalker, but do not respond. Record the date, time, location and details of what happened. Find a safe place to go in an emergency, for example, a police station, a public area or a friend’s house. It generally is not a good idea to go home if you’re being followed. Don’t travel alone. If you like to walk, jog or run, bring a friend with you. Do not meet, respond to or contact your stalker. Consider contacting UMPD to obtain a Personal Protection Order that tells the stalker to stay away from you. UMPD also can assist with other safety planning measures. Be mindful of where your personal information may be publicly available online. Consider removing or shielding your private information on social media sites and the U-M online directory. For more tips on developing a safety plan, read “Stalking Safety Planning.” This resource is courtesy of the Stalking Resource Center, a program of The National Center for Victims of Crime. A special guide, Our Community Matters, has been developed by the university to help you make decisions about what to do when stalking occurs. Contact DPSS Community Outreach at (734) 763-3434 or email dpss-safety-security@umich.edu. IF YOU ARE THE VICTIM OF STALKING, CONTACT THE DIVISION OF PUBLIC SAFETY AND SECURITY (DPSS) AT (734) 763-1131 OR REPORT A CRIME ONLINE. IF IT’S AN EMERGENCY, DIAL 911.